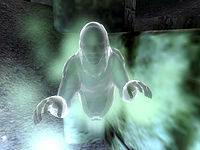 Ghosts are encountered at all levels, with the standard ghosts appearing at lower levels, and the ancient ghosts appearing at more advanced levels. Ghosts rely upon magical attacks, in particular Frost Damage. They have both touch and targeted attacks; the touch attacks are considered Lesser Powers, and are therefore unaffected by Silence effects. They can be encountered in Chapel Undercrofts, Ayleid Ruins and even Caves. Ghosts can only be damaged by Daedric weapons, Enchanted weapons, Silver weapons or Magic Spells. Ancient Ghosts are a more formidable variant of the standard ghost. They appear at higher levels, and in turn, they have more powerful spells and significantly more health. 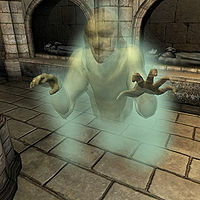 Ancient Ghosts are identical in appearance to standard ghosts, making it impossible to tell them apart at a long range. "Sanctified Dead" and "Ancient Sanctified Dead" are found in Chapel Undercrofts in most cities. At level 15+ they become Sanctified Ancient Spectre. Found in Cheydinhal Chapel Undercroft during The Elven Maiden quest. At level 12+ Llathasa's Spirit appears as a Faded Wraith. When ghosts are killed, their remains have a tendency of floating above the ground. They share the same problem with Wraiths. This page was last modified on 6 June 2015, at 03:43.